Batman & Robin is DC’s most marquee book of the week. I’m not well-versed enough in DC trivia to tell you what iteration of Robin we’re on, but I’m pretty certain it’s at least the fourth. The difference here is that this bean-pole sidekick is Bruce Wayne’s son. How is the caped crusader as a dad? How does the pair hold up as the focus of a debut issue that doesn’t come with the hefty background the new Robin emerged from? Will any comic in the relaunch be better than Batgirl? 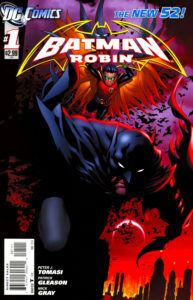 140char Review: Batman&Robin #1 focuses too much attention on petulant 10yr-old Robin, B’s son. He’s over-the-top. Not approps for kids, annoying for newbs. Why not “skip it” if I disliked the issue so much? Because this is one of those times when it’s clear that my opinion on comics has very little to do with the mainstream comic audience. As a new reader and non-Batfan, I found myself turned off every time Robin spoke. It’s not that I can’t suspend my disbelief that he’s a badass 10-year-old with a killer instinct. These are comic books, after all. It’s that he’s annoyingly one-note in every panel, even as Batman is as patronizingly doting as he’s ever been. Plus, so maudlin you feel like he might start hearing him hum a few bars of “Man in the Mirror” from beneath the cowl. Adding to that a super extreme villain to bookend the plot does nothing to improve the book. What it could have used was some subtly, anywhere. I feel like the tone might work for slightly younger readers (also hinted at by the cutesy logo treatment on the cover), but I didn’t get that vibe from the plot. Previous Post: « 30 for 30 Project, 1991: “Losing My Religion” – R.E.M.